We have a dirt pit in our yard where we spend lots of time digging, building with bricks, playing with construction vehicles, and even planting acorns...Little Guy is still hoping for baby tree to sprout up! I buried pieces from our foam alphabet puzzle in the dirt one afternoon and let the kids know there was a surprise waiting for them in the dirt pit! I couldn't help adding this picture of bare piggy toes checking out the buried letters. Little Guy loved this! He would find the letters and pull them out of the dirt for us. Big Sister (almost 6 y/o) is working on sounding out words and putting short words together to spell. This was a great activity for her. Little Guy (a new 4 y/o) can identify a few lower case letters, so this was a great challenge for him as he brushed off the dirt. After we found all of the letters, we dumped them into a soapy water bin and washed them off with tons of suds. What a fun sensory play experience this was on a hot summer afternoon! Little Guy discovered he could pop the bubbles and poke the letters down under the water with a stick. And, "Yes, you can squirt the letters across the driveway with the hose." Thank you for joining us! You'll want to follow the Sugar Aunts Blog, Facebook, Twitter, Google +, Pinterest and Instagram so you don't miss a post. 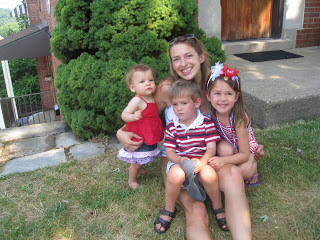 Colleen is one of 3 sisters behind the Sugar Aunts blog. Maybe Moms are not crazy about digging but their kids sure enjoy it! We are totally doing this tomorrow! Thanks for the inspiration!